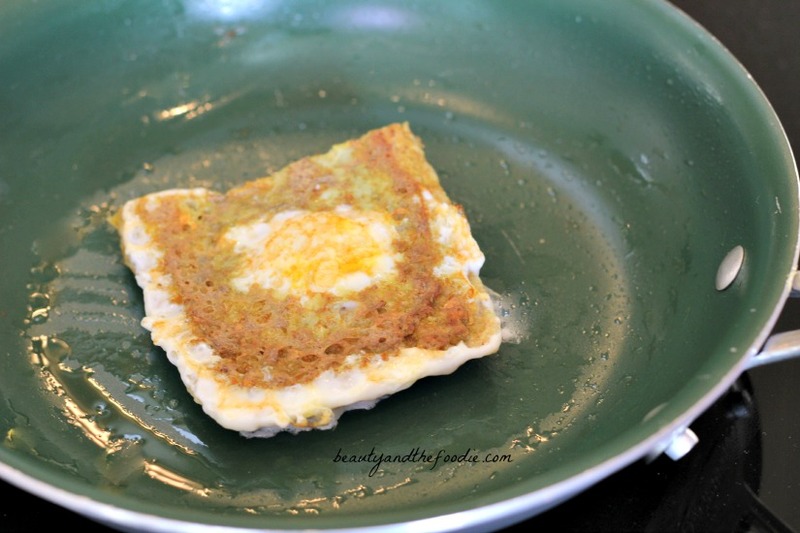 A Low carb & paleo eggs in a hole recipe that is grain free and gluten free. Paleo, grain free and low carb. 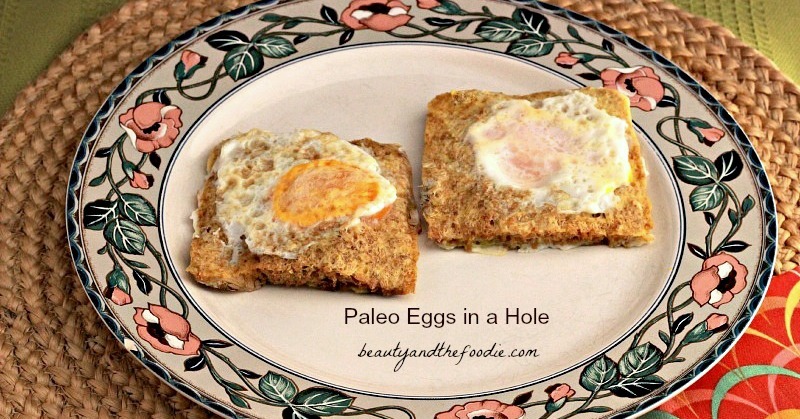 Paleo Eggs In A Hole, or eggs in a basket, or toad in hole, or also known as eggs in a frame. This classic egg dish goes by many names. 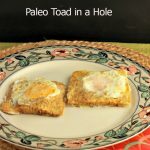 Actually, the true” Toad in a Hole” dish is sausages baked in Yorkshire pudding originating from the UK, and my family (Americans) have always called this egg dish “Toad in a Hole”. So they have been calling it the wrong name for a long time. 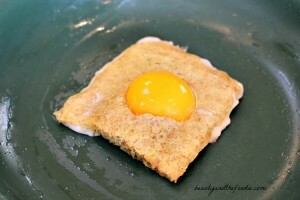 Basically, it is a fried egg inside a “cut out” in your toast. I made a version that is paleo, grain free, starch free, nut free and low carb by using my grain free quick bread in place of regular toast. This recipe is actually 0 net carbs because of the fiber content is higher than the carb count. So, this recipe is great for Keto or Atkin’s induction. To find other delicious Low-Carb, Gluten-Free recipes, visit with us on Facebook! Please support the team by buying: Gluten Free Low Carb Recipe Books. 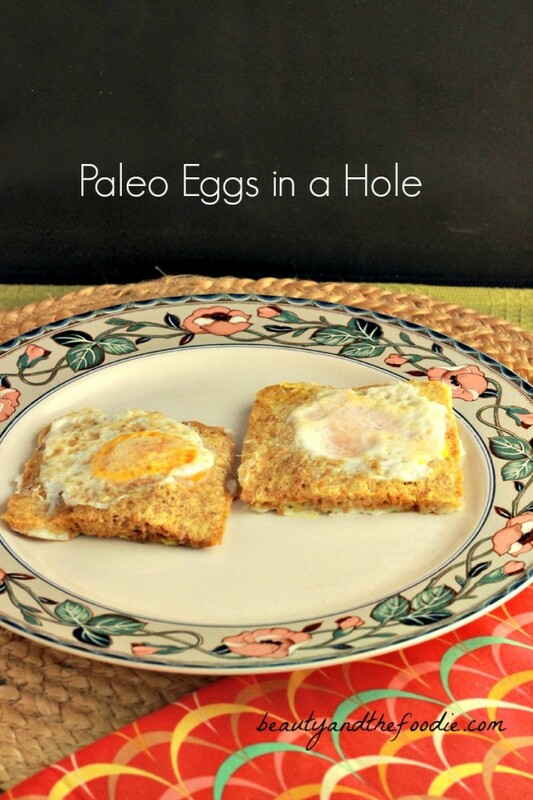 A paleo and low carb breakfast that is easy and nut free. 1 tbsp coconut or almond milk. ¼ tsp baking soda + ½ tsp apple cider vinegar mixed in a separate pinch bowl. 2 tsp butter ghee, or coconut oil. Preheat oven to 400 F, and grease or oil a loaf pan. 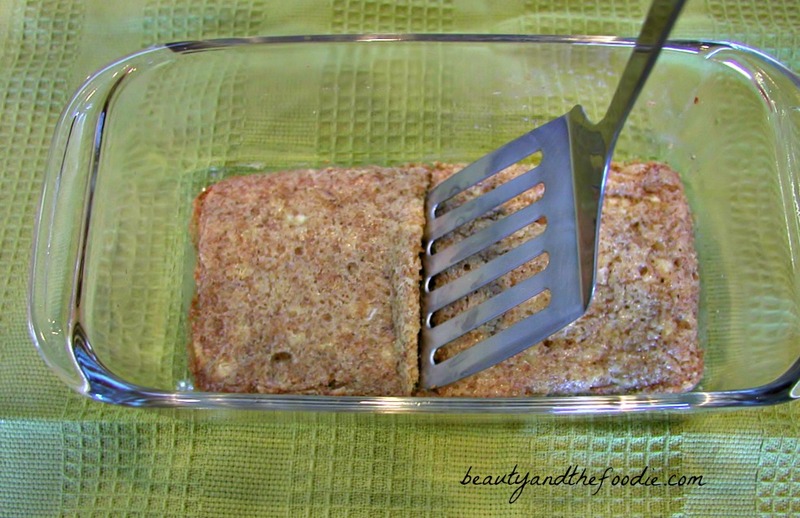 Combine all quick bread ingredients in the loaf pan and stir until completely combined. Bake the bread in the oven for 10 to 12 minutes until browned. Remove bread from oven and cool completely. 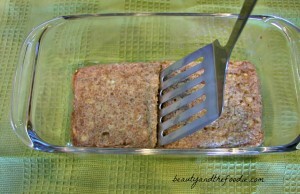 Slice bread across the middle and slide a spatula under the bread and lift out of loaf pan * as seen in photo above. 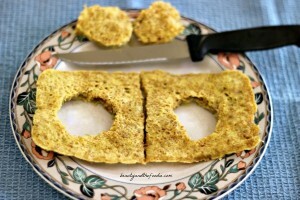 With a knife or biscuit cutter cut a hole in the center of each piece of quick bread. Oil or grease a fry pan and place on stove top on medium heat. 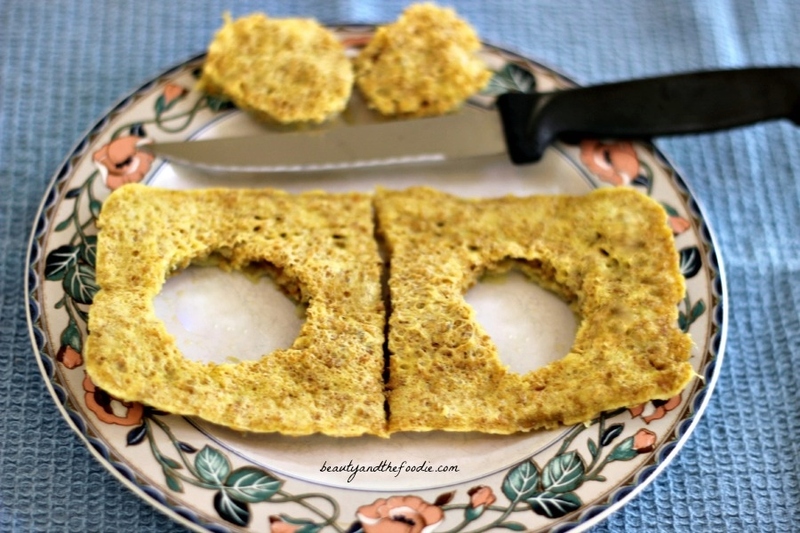 Place bread in fry pan and crack an egg into each bread hole, * as seen in photo above. Cook eggs for a few minutes and then flip over to cook other side of eggs and bread. Remove from pan with spatula once eggs are cooked the way you prefer. Kathleen, It is a 9 x 5 loaf pan. Just made this recipe, SERIOUSLY YUMMY! I’m heading out to my kitchen to make this NOW! BTW, we call them One Eyed Jacks! Michelle, Thanks for trying the recipe and taking the time to let us know the results. One Eyed Jacks, that is one I haven’t heard before. I love that name! Any chance anyone has tried to double or triple this and use a larger pan? We are a growing family of four 🙂 my two year old had fun making bread with me tonight, and liked it so much she asked for more! Can’t wait to introduce it to my husband. Great recipe. I’m off to look at more of your recipes! Mamie, I think you could double or triple the recipe and use a bigger pan. That is a great idea. not sure why but in the south we call them hobo eggs. Liz, I have not heard that one before! Would be interesting to find out how that name came about. This looks good but the fiber cannot be higher than the carb count. Every gram of fiber is one gram of carb but you just can’t process it that’s why you don’t count it. My grandpa made these for me as a kid and we called them Popeye’s. Will try this recipe tomorrow. Thanks! Can you microwave the bread? Kieran, Yes you can microwve in a glass or other ceramic loaf pan for 1:30 minutes to 2:00 minutes, depending on your microwave. Love this recipe. But here in Australia we would call it… egg in a window. Will make it tomorrow. Hi Jo, egg windows, I have not heard that name yet. Thank you for sharing the Australian name with us and trying the recipe!